As a wedding photographer, I get to see a lot of really fun, unique weddings. There are so many amazing ideas and resources for planning weddings out there now, and I am glad I do not have to plan one myself because I would be overwhelmed with decisions! This Pinecrest elopement is definitely one of my favorite weddings ever. When Amanda first contacted me, she asked if I would be willing to drive for miles on a dirt road and then hike about an hour on a trail with her to meet the officiant and the groom for a private ceremony. It sounded amazing to me, and I jumped at the chance! Then we actually got snow in California, and the original location was snowed in. So a new location was chosen, and while it was not as private or very far out there, we still had to hike on mountain trails. (And whatever Amanda’s dress was made of was amazing. She let the train drag for the entire hike, and we wandered in a muddy field, and it didn’t get dirty!) The bride and groom said their vows on a cliff overlooking Pinecrest Lake, and then we hiked back in for photos of the two of them before they headed off to a family dinner celebration at Seven Sisters at the Black Oak Casino Resort in Tuolumne. It was such a sweet, intimate wedding for these two! Laci Patten - Wow! Gorgeous couple and gorgeous backdrop!! You captured this beautifully! Corey - These photos from their elopement are absolutely beautiful! Love that location with all of the trees and the water! Just perfect for an intimate wedding ceremony! sarah sweetman - Oh my goodness – what an amazing elopement – I love the way you captured the natural beauty alongside their love – the locations around Pinecrest were awesome and used the different light sources to your advantage. They are totally in love and you can feel that through every single image. My favorite is the one of the rings in the tree – it was a beautiful way to photograph their rings – you did a wonderful job capturing this moment in time for the happy couple! Patty - I love that they hiked to get to where they planned to elope! Your wedding photography is stunning. The light in the portraits is just stunning. Pinecrest is gorg!! Kathy - As I was reading your description, my fingers were itching to scroll down and look at the images! You described the scenery so beautifully I had to see them before I even finished reading! The scenery is so incredibly gorgeous, second only to the bride and groom! Pinecrest Lake was the perfect choice for a secluded and private wedding ceremony. 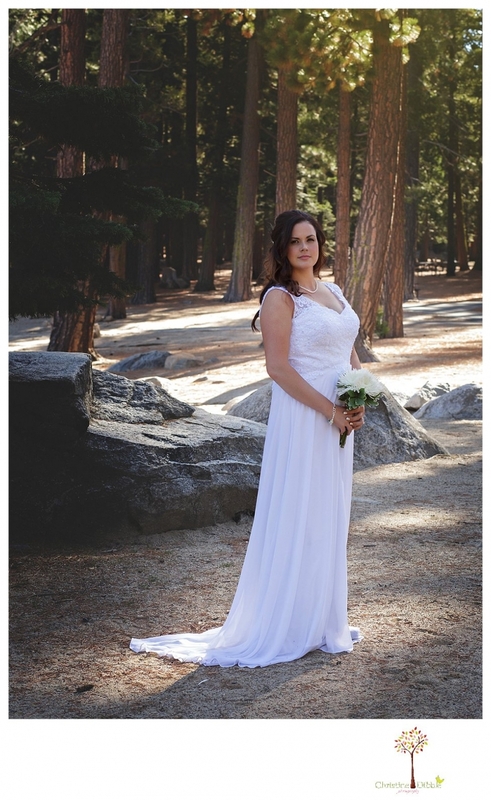 Samantha - Wow a beautiful elopment at Pinecrest Lake. Seriously what an amazing view and how beautiful are your portraits of the newlywed couple. I couldn’t agree more that Amanda’s lace wedding dress was perfect for the scenery, and oh my how cute is her fiance’s blue bow. Gorgeous Pinecrest elopment session! Jenny Storment - This Pinecrest Elopement turned out amazingly! Beautiful job on this super cute couples’ elopement photos! Megan - Wow! What a dream!! I love your documentation of this beautiful elopement! 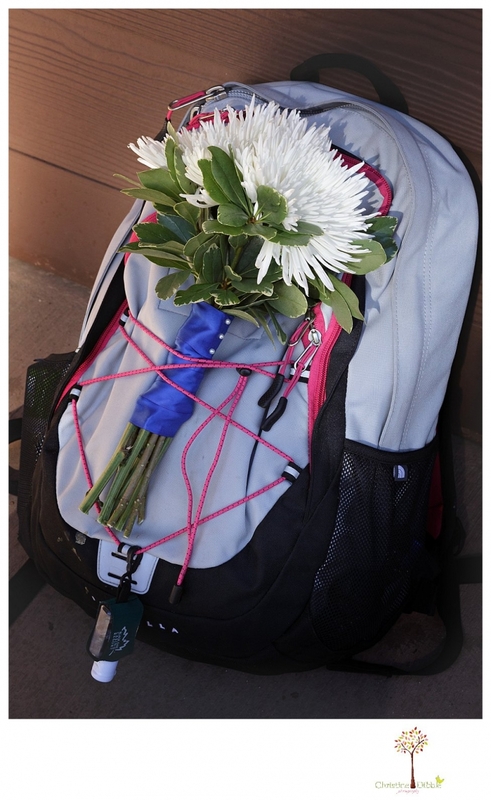 Great photography work here Christine!! 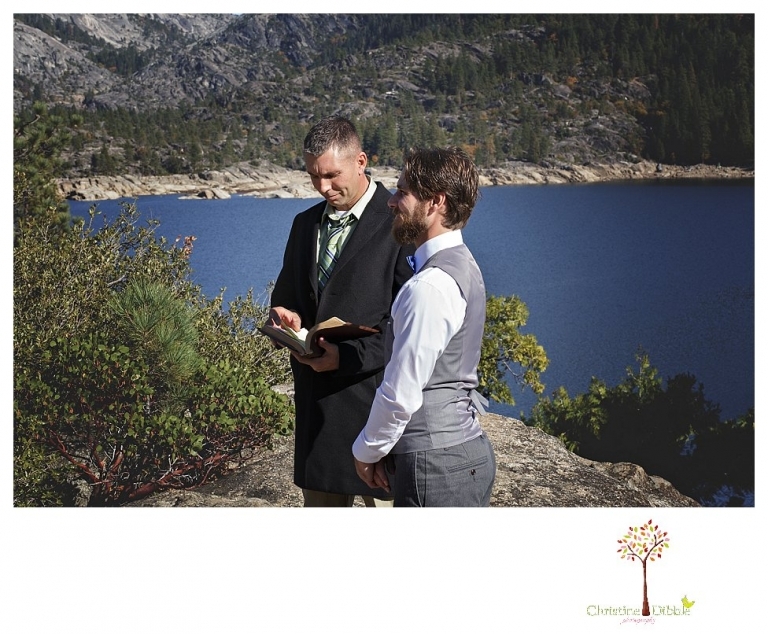 Jennifer Rittenberry - I love how this couple did what was right for them and eloped at Pinecrest Lake. It makes the wedding ceremony so intimate and special for the couple (not to mention the gorgeous view on top of the cliff). You did a wonderful job on their posed wedding shots in the forest as well. I especially loved the ones where the couple were sitting on the log! Dawn - Christine you have such a beautiful style of editing your portraits! This mountaintop elopement is gorgeous and your couple is so much in love with each other! Can we talk about your ring picture for a second- it is so crisp and bright-just a dynamite shot.